Climate change, new environmental technologies, and energy and water sustainability are cultural and political challenges, not just technical issues. Solving our human-environment challenges requires integrated solutions that require citizens to be informed about environmental issues and motivated to make change. However, little is known about how education systems are – and could be – influencing sustainability. Existing research on sustainability policy and practice in education is scarce, uncoordinated, and regional. The Sustainability Education and Policy Network (SEPN), an international network of researchers and organizations advancing sustainability in education policy and practice, emerged in response to these knowledge gaps. 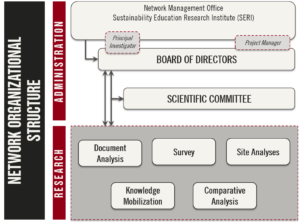 SEPN is hosted at the Sustainability Education Research Institute (SERI), located at the University of Saskatchewan in Canada, and funded by $2 million in Social Sciences and Humanities Research Council (SSHRC) funding and $1 million in matching funds from partners and contributors. Integrated partnerships between researchers, organizations, and policy partners form the basis of the SEPN vision. As a global consortium of researchers and policy actors, SEPN is undertaking policy research in international, national, and regional education systems to provide rigorous, comparative evidenced-based understandings of policy, and enable deeper responses to sustainability. In 2012, SEPN began the world’s first large-scale, national-level research collaboration by collecting and analyzing comparable data across Canada’s formal education system. This allowed an examination and comparison of the range of sustainability policies and practices being developed, implemented, and experienced in Canadian primary, secondary, and post-secondary contexts. Since then, SEPN has expanded its focus to research in other countries internationally. SEPN’s partnership model’s focus on research-informed policy making provides researchers and policy makers with a framework for increased collaboration on policy research and sustainability development in education to maximize the potential for impact. An overview of SEPN’s impact to date is available in the Impact Report.